There is no one thing that constitutes sand. It is rather a collection of tiny particles that are varied in shape, colour, and origin. Really, sand is defined by its size rather than by content – in geology, that size is between 0.0625 and 2 millimetres in diameter. Sand is formed as rocks are broken down by weather processes, such as wind and rain, and streams of water. Depending on where you go in the world, if you look at the local sand closely enough, you will see different things that can teach you a lot about the environment it hails from. For example, the finer the sand, the more it has travelled in water, giving it time to break down smaller and smaller. 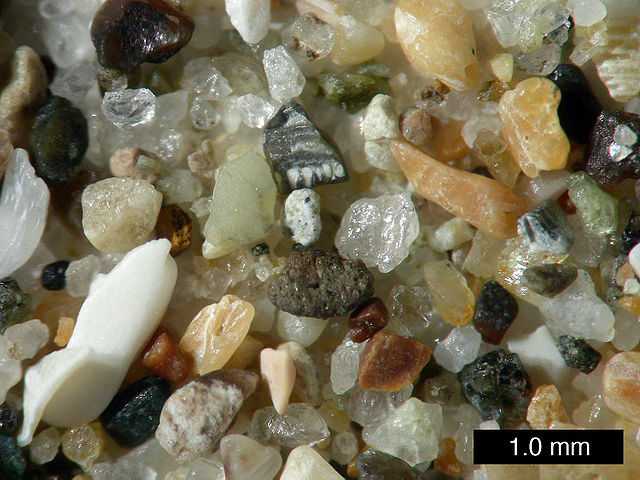 Here are three things that you can find if you look at sand under a magnifying glass. The most common mineral found in sand is quartz (silicon dioxide) because it is contained in several ubiquitous types of rock, such as sandstone and granite. More than 10% of the Earth’s crust is made up of quartz, making it the second most abundant mineral after feldspars, which are also generally found in sand. Because quartz is hard and doesn’t easily dissolve in water, with enough weathering it will separate from the other minerals present in the rock that contains it, forming little crystals that we eventually encounter as little translucent grains of sand of various colours. This category of sand materials actually includes quartz as well, because types of quartz are used as semi-precious gemstones in many cultures. Since a gemstone is essentially a pretty mineral that can be used in jewellery, there is no strict definition for what qualifies. However, there are minerals that are highly valued as gems, while broken down they are also scattered on the beaches of the world. Amongst these sand gemstones are garnets, tourmalines, andalusites, and occasionally even rubies, sapphires, and diamonds. Clams, snails, and other sea creatures form tough shells made out of aragonite, a crystal form of the abundant chemical compound, calcium carbonate. Just like the minerals washed out of rocks via weathering processes, aragonite and other shell materials eventually break into sand grains as well. However, there are tiny marine protozoa – single-cell organisms – that also create shells, often smaller than 1 mm. That’s instant marine organism sand material, which on some beaches can even form the majority of the sand.